Indra is the most important deity in ancient Vedic Hinduism and the supreme deva (god) of the Rigveda scripture. Known as the god of storms and war, he controlled the weather, rain, thunder and lightening. His connection with storms led to his association with war, and he was frequently propitiated by the Aryans before going into battle. Stories of Indra's victories over evil entities (such as the serpent Vrita) are found in Hindu scriptures. He is also described as delighting in the consumption of Soma, a hallucionogenic beverage that is said to have enhanced his divine powers. As Hinduism evolved, however, Indra's powers were eclipsed by the god Vishnu who became a more powerful and popular deity in classical Hinduism. Indra is the most important deity in Vedic Hinduism, and is celebrated in more than 250 hymns within the Rg Veda alone. This total is surpassed only by Agni, the personification of fire. The Vedas are primarily henotheistic, with one god maintaining primacy over the other deities. In the beginning, Varuna, the personification of the supreme moral order in the universe, held position atop the Vedic pantheon. However, as the Vedic stories progress, it is Indra who rises to this supreme position, and Varuna is usurped in battle by Indra's brute physical strength and unsurpassed autonomy (svaraj). Indra thus supplanted Varuna as the supreme god. His victory over Varuna consolidated his status as a slayer of enemy deities and therefore the divine protector of the Aryan way of life, particularly the warrior class, for which Indra is the patron. Warriors no doubt held great esteem within Aryan society; therefore, Indra's rise to the top of the Vedic pantheon may mark the veneration of the militaristic principle over and above that of the life of the Brahmins. Unlike Varuna who is king by divine right, Indra is a king by conquest; therefore the Vedic myth seems to imply tensions that may have existed between the ruling Branminical caste and the Kshatryas, the warrior caste which they outranked. Many ancient cultures worshipped gods of war including the ancient Aryans whose nomadic lifestyle as hunter warriors lead them to value the attributes of strength and vigor that were personified in their warrior god, Indra. Indra was likely a proto-Indo-European Aryan deity who paralleled warrior gods found in other Indo-European cultures. For instance, Indra resembled the supreme Greek god Zeus, the Roman god Jupiter and the Scandinavian god Thor who also controlled thunder and lightning. 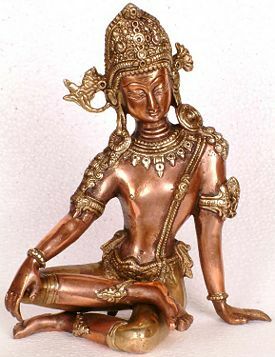 Moreover, Indra resembled the Greco-Roman gods of intoxicating drinks, such as Bacchus or Dionysius. However, if Indra followed from proto-Indo-European gods, his name was either not preserved in any other religion, or else was itself an Indo-Iranian innovation. Janda (1998) suggests that the proto-Indo-European predecessor of Indra had the epitheta trigw-welumos ("smasher of the enclosure," referring to his defeat of Vritra) and diye-snūtyos ("impeller of streams"; the liberated rivers, corresponding to Vedic apam ajas "agitator of the waters"), which resulted in the Greek gods Triptolemos and Dionysos (221). In the Vedic religion, Indra has prominence over Dyeus, who was formerly the chief god of the Indo-European pantheon. Dyeus appears in the Vedas as Dyaus Pita, a relatively minor deity who, interestingly enough, is described in Hindu mythology as Indra's father. The Rig-Veda frequently refers to Indra as Śakra, "the mighty-one." Additionally, Hindu scriptures refer to Indra by a number of other titles such as Mahavendra, Pu'rendra, Vāsava, and Vaka-shana. By the time of the Hindu epics, Indra became the prototype for all human lords, and variations of his name served as a suffix for rulers. Thus a king could also be called Mānavendra ("Indra" or "lord of men"). Similarly, Rama, the hero of the Ramayana, was referred to as Rāghavendra (Indra of the clan of Raghu). Indra himself was also referred to as Devendra (Indra of the Devas). However, the titles Sakra and Vasava were used exclusively for the original Indra. Although modern texts usually adhere to the name Indra, the traditional Hindu texts, such as the Vedas, the Epics, and Puranas, use Indra, Sakra and Vasava interchangeably. As a result of defeating the demon Vrtra, Indra also earned the title Vrtrahan, or "slayer of Vrtra." Indra was born of a human mother and father, marking him as the only Hindu god to come from human progenitors. Despite this human origin, Indra possesses transcendent qualities, such as the ability to take innumerable physical forms. Nonetheless, artistic depictions of the god have commonly characterized him as a muscular man, golden or reddish in color, sometimes with four very long arms which are said to span the entirety of the skies. Indra is normally depicted riding a resplendent golden carriage which is drawn by two brown horses with flowing manes. In his right hand he carries his vajra, or thunderbolt, which is said to have been constructed from the bones of the seer Dadhichi. The weapon itself is circular with a hole at its center, and serves the purpose of creating both lightning and thunder. Indra also employs arrows, a net, a huge lance and the anka (a hook) for the purpose of catching enemies. When portrayed having four arms, he has lances in two of his hands that resemble elephant goads. When he is shown to have two arms, he holds only the vajra and a bow. Indra is said to live in a heavenly abode within the clouds surrounding the mythical Mt. Meru. This heaven is called Svarga ("the good kingdom") and is populated by deceased warriors as well as those who have lived meritorious lives. The inhabitants of Svarga live without sadness, pain or fear. The gods of the elements, celestial sages, great kings and warriors enrich Indra's court, and together they watch the Apsaras (female cloud spirits) and their husbands the Gandharvas (male nature spirits) dance, sing and play games. Despite his exalted divinity, Indra is not a perfect being, and is ascribed with more human characteristics and vices than any other Vedic deity, probably due to his human origins. For instance, when he is intoxicated with soma, Indra has a penchant for garrulous, drunken boasting. Moreover, a number of well-known stories about Indra tell of sins, such as murder and extramarital affairs) that he committed and his subsequent punishment. He who gave being to the Sun and Morning, who leads the waters, He, O men, is Indra. In his capacity as the warrior god, Indra takes responsibility for defeating malevolent entities. In classic Vedic tales and in the later Epics, he constantly wages war against the demonic Asuras and Daityas of the netherworlds who oppose morality and dharma. Indra consumes soma in preparation for these epic battles between good and evil. In addition, in his capacity as a defender of good he is considered one of the guardians of the directions, typically defending the east. As such, Indra has significance for all warriors, and is said to be invoked by combatants on both sides of the battlefield, as evidenced in the Battle of the Ten Kings, a war between Aryan tribes described in Mandala 7 of the Rigveda. Indra's most famous vanquishing of evil came during his battle with Vritra, a malevolent serpent who stole all the primordial water in the world causing widespread drought. Indra drank much Soma to prepare himself for the battle with the huge serpent, then passed through Vritra's 99 fortresses, slew the monster with his vajra (thunderbolt) and brought the fecundating waters back to Earth. Yet, despite his immense physical power, Indra does not always win battles. In a later version of Vritra story, Vritra was created by Tvashtri, the divine carpenter, in order to get revenge for Indra's murder of his son, Trisiras, a pious Brahmin whose increase of power worried Indra. Vritra won the battle and swallowed Indra, but the other gods forced the serpent to vomit Indra out. The battle continued on until Indra fled. Vishnu and the Rishis brokered a truce, and Indra swore he would not attack Vritra with anything made of metal, wood or stone, nor anything that was dry or wet, or during the day or the night. Indra used the foam from the waves of the ocean to kill him at twilight. In yet another version, recounted in the Mahabharata, Vritra was a Brahmin who got hold of supernatural powers, went rogue and became a danger to the gods. Indra had to intervene, and slew him after a hard fight. A horrible goddess named Brāhmanahatya (personified sin of Brahmin murder) arose from the dead corpse of Vritra and pursued Indra, who hid inside a lotus flower. Afterward, Indra was forced to beg forgiveness from Brahma for the brahminicide he had committed. The Vedas make it clear that Indra delights in drinking soma, an energizing and possibly hallucinogenic beverage of ritual importance. Indra's immense cosmic power is attributed to the copious quantities of soma that he consumes. The intoxicating power of soma was thought to provide both gods and mortals with such attributes as immortality and invincibility. Soma played an indispensable role in Vedic sacrifices, and humans commonly offered the beverage to the gods so they might maintain their transcendent qualities. While each of the gods consumed a portion of the soma offered at Vedic ceremonies, Indra was said to consume the most of them all, which increased his already immense strength, and therefore rendered him the most powerful god. In this way, Indra came to be the focus of the soma ritual. In later mythology, Indra was supplanted from his position at the top of the Vedic hierarchy by the Hindu trinity of of gods known as Vishnu, Shiva and Brahma. Thereafter, Indra was relegated to the second level of gods, which was comprised mostly of outdated Vedic deities. Indra still maintained supremacy over these older gods. The numerous deities of the Vedic pantheon have fallen into the background as contemporary Hindus often worship a personal supreme god such as Shiva, Vishnu, Devi or Surya in monotheistic fashion. Thus, Hindus usually see Indra as minor deity in practical worship. Indra's role in mythology began to change as well. In the Puranas, a collection of seminal Hindu myths, Indra is featured in numerous stories as the main adversary of Krishna, the most famous avatar of Vishnu. One puranic story that illustrates Indra's subjugation involves his confrontation with the Hindu god Krishna. In this story, Indra, angered by the general lack of worship he has come to receive, launched incessant rains over a village but Krishna lifted up a hill to protect his devotees from the waters. Indra's subordinance was further promulgated in the Epics. In the Ramayana, Indra is the adversary of Ravana, king of Lanka, who battles against Indra in heaven. Indra is defeated by Ravana, whose son Indraji adds insult to injury by binding Indra in serpent nooses and dragging him across Lanka in a humiliating display. Indra is eventually released when Brahma convinces Indraji to do so, but Indra, as the defeated, had to accept Ravana's supremacy and pay tribute to him. Indra does as he is told, and is eventually avenged by Rama, another avatar of Vishnu, who slew Ravana. Indra's character is slightly retooled in the Mahabarata, where he becomes associated specifically with the eastern regions of India, and rides a large four-tusked elephant named Airavata. While the battle between Indra and Vritra is included in the Avesta, the Zoroastrian holy book, Zoroastrianism takes a much different interpretation of Indra's character. Rather than venerating Indra as the supreme embodiment of good, Zoroastrianism instead claims Indra to be the leader of "false gods" (which refers to virtually all gods other than Ahura Mazda, the supreme deity in Zoroastrianism). These beings are equated with demons. In the Vendidad, the most recent of the texts within the Avesta, Indra is identified as one of the six chief demons that are seen to stand opposite the six Amesha Spentas, spirits which put in place the benevolent will of Ahura Mazda. Vendidad 10.9 explains that Indra is the direct enemy of Asha Vahishta, who personifies the aspect of asha/rta or Truth. Thus, Indra is the opponent of order, truth, and righteousness. Similarly, in the Denkard, a ninth-century Middle Persian text, Indra is the arch-demon that "is the spirit of apostasy and further deceives the worldly existence of mankind" (9.3). In the Bundahishn, a Zoroastrian account of creation, Indra "freezes the minds of the creatures from practicing righteousness just like much frozen snow. He instills this into the minds of men that they ought not to have the sacred shirt and thread girdle" (27.6). The shirt and girdle are garments that must be worn by all devout Zoroastrians, thus Indra stands in diametric opposition to one of the indispensable aspects of the Zoroastrian faith. At frashokereti, the eschatological regeneration of good within the universe, it is said that Indra will be defeated by Asha Vahishta (34.27). In the mythology and iconography of Indra that arose after the Vedas in the heterodox Indian schools of Buddhism and Jainism, Indra retained his role as chief of the gods. Although Jainism is non-theist, it is Indra who awards Jain founder Mahavira with a golden robe during his earthly life, and later welcomes him into heaven upon his death. Buddhists also acknowledge Indra as the original leader of the Devas, ruler of the heaven of the Thirty-three gods. All in all, Indra is rarely referred to in Buddhist texts, and when he is it is either as a minor deity (a lord of the yakṣas, for instance), or as the object of worship of the Brahmins. Sikhs believe that there is only one god without question. However, the Gurus still mention numerous Hindu deities in the Guru Granth Sahib, including Indra. Bhagat Kabir Ji, whose hymns are found in Guru Granth Sahib Ji, mentions Indra among other Hindu gods: "Beings like Hanumaan, Garura, Indra the king of the gods and the rulers of humans—none of them know Your Glories, Lord" (Ragg Dhanaasree, Panna 691.2). Passages such as this illustrate the Sikh belief that although Indra and other personalistic dieties have been meditated upon by the minds of humans for thousands of years, they merely as a function of maya and do not allow for full a complete understanding of the one supreme God. Although the Sikhs do not worship Indra specifically, his name also appears as a part of many Sikh compound names as the ending "inder." This ending represents the strength and virility in battle that Indra embodies, and can be used by both males and females. Janda, M. Eleusis, das indogermanische Erbe der Mysterien. Innsbruck: Institut fur Sprachwissenschaft der Universitat Innsbruck, 1998. Masson-Oursel, P. and Louise Morin. "Indian Mythology" In New Larousse Encyclopedia of Mythology. Edited by Robert Graves. New York: The Hamlyn Publishing Group, 1976. pp. 325-359. Sikh Basics and Misconceptions. Info-Sikh.com. Retrieved June 8, 2007. Sikh Naming Practices. All About Sikhs – Your Gateway to Sikhism. Retrieved June 8, 2007. This page was last modified on 2 March 2018, at 21:03.